We opted not to host Thanksgiving dinner in 2014 because we had another cat, Pippie, who was dying of cancer. I didn’t want to stress her out because she was sick. We had “Thanksgiving dinner” for my birthday in 2015 instead. For Thanksgiving 2015, we opted for a quiet affair with just the two of us. 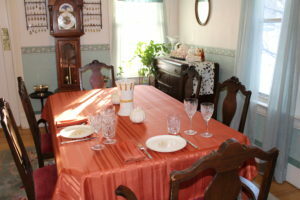 I chose a pretty rust colored tablecloth and matching napkins I purchased from Kmart, and the Official Thanksgiving China of The Sisters-Homer Laughlin’s Golden Wheat (various sources). Doesn’t that rust color just make the wheat pattern pop? I thought so, too. Since it was just the two of us, I used my beloved Waterford Crystal in the Thanksgiving/Harvest pattern (Cash’s of Ireland). Great Grandma’s Coronation flatware by Oneida was pressed into service, and the centerpiece was simple-my Belleek Sheaf of Wheat vase made in Ireland (QVC) flanked by two white pumpkin candle holders by Slatkin & Co. (thrift store find). It was a nice, sweet, wonderful Thanksgiving day!